So the Pedal Power Crew rented out the Haven Skatepark for a Holiday Session. Some friends and family came along to shred and fun was had by all. 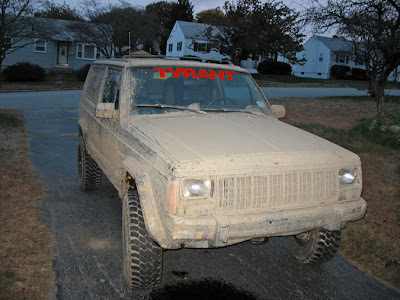 Check out the few photos I shot over at TYRANT's Photos. 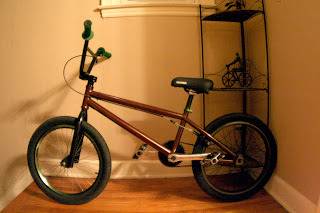 So T got one of her Christmas presents a week early, a new BMX bike. She was riding an Intergral Slauson that Bill at Pedal Power gave me a smoking deal on about a year ago. 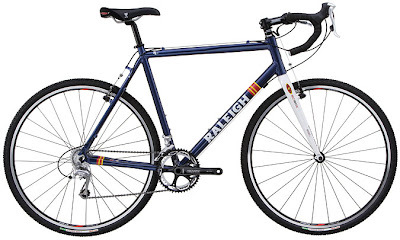 The Integral was cool, but it had an American BB, regular headset, and weighed 34 lbs. That's a tank of a bike for a 125 lb. girl to handle! T's new ride is a coffee colored 20.75" Eastern Dragon complete with an Odyssey Pro Dirt Fork, MacNeil Light Bars, Primo Powerbite Cranks, Integral Cassette Wheel, and lots of green accents. Green Shadow Grips and BB, Animal Seatpost Clamp, and a sick custom built front wheel...an anodized green old school Velocity rim laced to a GT Mohawk Hub. Any other rider would destroy this front wheel, but T is light so it will hold up no problem. Rumor is there may be a ladies only session at the Haven Skatepark in the near future. Get your girlfriends riding!!! Wow, what a rad weekend! T and I rode Haven Saturday night and Sunday and we're both beat! Head over to the TYRANT Photos to check out all the pics I shot. 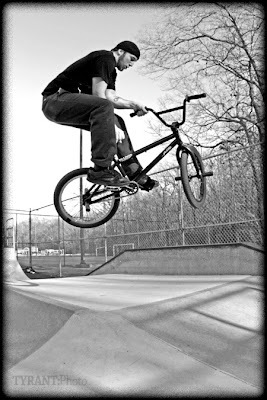 T actually took a few photos of me too...yes, I still ride bmx. So Craig Samuels, long time TYRANT supporter and CT local, has been out in San Fran. at film school since the end of the Summer. Craig shoots me a trusty MySpace message now and again to let me know he's alive, but the message I got last night was rad as hell!! Check out this quick short produced by Craig...and check out the last 15 seconds of the video. Craigs getting ill on his fixed gear! SO SICK! So Arnwine and I met the whole Pedal Power Crew at the Haven Skatepark last night for the BMX session. I think the highlight of the night was Gary Nicol, one of the owner's of Pedal Power. Gary blew off the mountain bike ride he was supposed to attend, took (bought) a DK Dayton from the shop, and came and rode the park in a road bike helmet and Dr. Martins. Great! Everybody was having fun and it was rad to watch some of the locals totally kill the place. 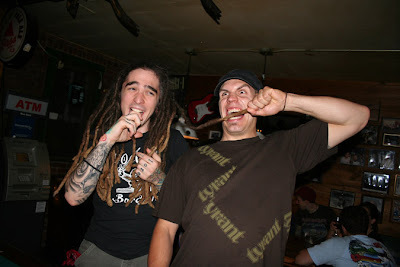 Check out the photos I shot over at TYRANT's Flick. "Sick Boy! Nah, nah - nah - nah, nah"
Ah, what a great old Social D song. Anyway, I've been sick boy since last Sunday. Coughing up a lung, running a fever, and feeling like a pile of crap. Cyclocross season finally got the best of me. Well, my fever broke and I feel a little better today even though my throat is still on fire. 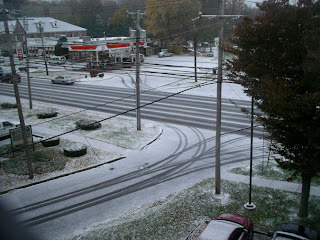 Tomorrow is the 1st of 2 races this weekend to end the 2007 New England Cyclocross season and its going to be hellish! The weather's supposed to be in the low 30's with snow showers, so I'll most likely get bronchitis next week, but I'm ending the season on the bike, not sick in bed! So with that said, I'm off to bed. Gotta be up at 5 am and on the road to Rhode Island by 6. 2 more days and the season is over...so I'll be at Haven Skatepark a few times a week from here on out. SICK! 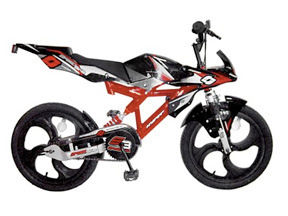 So JUNK*MART claims this is one of the "Hot Bikes this Holiday Season". Are they out of their minds? Who manufactures this crap? Somebody please go to Wal*Mart and buy me one of these for Christmas...so I can ghostride it into on coming traffic and burn it! I pity the pathetic parent that actually purchases one of these death-mobiles for their kid! Be sure to purchase the supplimental insurance policy that goes with it! So there was a crazy crash at the Haven Skatepark Saturday night. I have no idea how either of these guys walked away uninjured!!! So T and I went to the Haven Skatepark late last night for the BMX session. The park is pretty sick! and tons of riders were there. It was awesome to see so many people I haven't seen in ages. I shot a bunch of photos which can be viewed over at TYRANT's Photos. I have to get more comfortable shooting indoors, the lighting throws me for a loop so don't mind some of the blownout photos! I got this album recently and it could be the greatest Christmas related thing on the face of the Earth...besides popcorn balls and cherry candy canes! 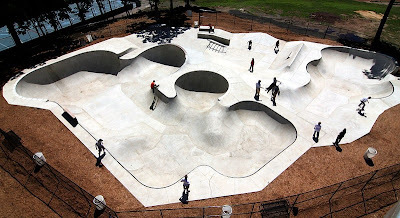 Haven Skatepark is set to open its doors sometime this week, so memorize the bike sessions and be ready to shred! I'm also going to be looking into renting the park once a month. Check back for details on that in the near future. Perfect timing cause its snowing out right now!!! 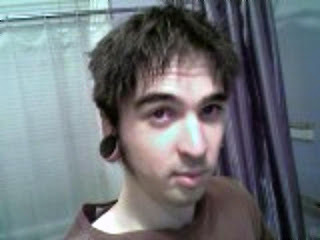 So the day has finally come, Hebrank cut off his dreads! The dreadlocks will be polyurethane coated and sold for $10 each. These are collectors items! They are 2 feet long and great for belts, dog leashes, rope, etc. All proceeds will benefit the "Fly Tyrant to MinneCRAPolis Fund." So the new TYRANT mega decals are in and they look great! These are ideal for your car windshild, ramps, buses, etc. A huge thanks to Shawn Hebrank for coming through via his connection in MinneCRAPolis! Contact me if you want to purchase a decal, they are super limited!!! These things are huge, 16" x 4", cut from high quality "Blood Red Vinyl". A $15 donation is all it takes to get one of these decals. All proceeds go toward a giant bags of beef jerky from Sam's Club for Shawn. CLICK ON THE PHOTO TO SEE IT LARGE! 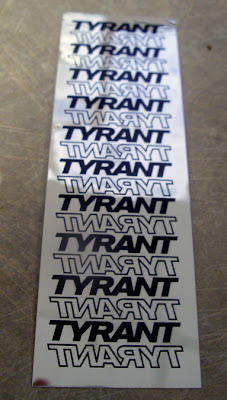 The new chromed out TYRANT stickers are in. Head down to Pedal Power to grab some or find me in person. These stickers were intended for placement on fork legs, but you can stick 'em anywhere you want. They are super reflective and look hot! This weekend is going to be pretty nuts! I'm racing the Chainbiter UCI cyclocross race in Farmington on Saturday and the CycleSmart International in Northhampton, Mass. on Sunday. Both races begin at 9 am and over 85 riders are pre-reg'd for each days race! It looks as though temps. are going to be in the low/mid 30's both mornings, DAMN! Come out and get rowdy!...and bring your cowbells, air horns, megaphones, etc. Sold Out to Stay Loyal! So last night was the Devils Night Alley Cat and I totally sold Drew out! I never got the bag of swag I was donating from TYRANT and DEATH 2 DOPERS down to New Haven cause I left Monday to Boston for the Red Sox Parade. Sorry dude, but I had to to sell out to be a loyal Sox fan. Alley cats are going on all the time, but the Sox winning the Series has only happened twice in the last 86 years! I had to go...may be the last time in my life I'd have the opportunity! I don't have the Boston "B" tattooed on my ankle for nothing! I hope the race went well and I still plan on giving you all the swag I promised you so you can hand it out or use it for future races. 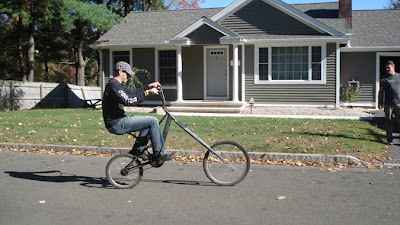 I was over my cousin Johns yesterday tooling around on his chopper bicycle that he acquired from Shawn Hebrank. Shawn and Andy fabricated this beast a few years back and its been put to good use lately. That thing is nuts! 5 foot high handlebars and a 3 foot high seat. Word on the street is that there is going to be a race between Drew from New Haven and I. Drew has a killer chopper fixed gear tall bike, at least 6 feet high. Your going down Drew! Check out the photos T shot at TYRANT's Photos. 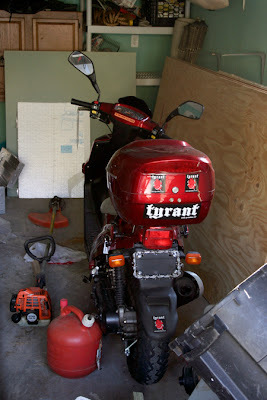 Also, John is selling the Team TYRANT Moped, his 2006 49cc ripper that he paid $2,600 for. He is asking $1,200 which is a steal for this thing, so tell all your friends. So I only rode the MSX Trails once this year, pretty pathetic, but nobody was up-keeping them so I don't feel guilty. T and I stopped by the trails yesterday to see how things were looking. 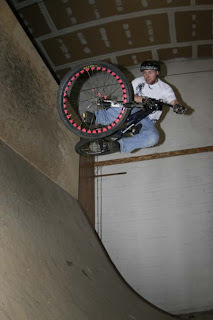 We had hopes of raking out the place and tidying up the jumps enough to make the place ridable till the 1st snow fall. 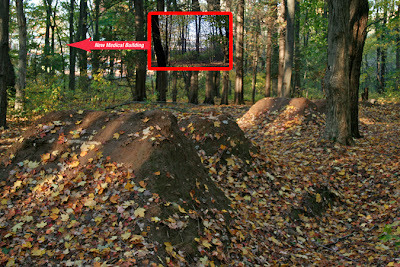 To my surprise there is a new medical building being built less than 100 yards from the trails right through the woods. Based on the property markers that were staked out the small set and berm are on the land of the medical building. With that said, I think MSX is truly going to see its death this year. I'm going to stay optimistic, but I wouldn't doubt the trails are leveled before 2008. Lots of good memories at those trails, especially from 2001-2003 in the Haggerd Trails days when I was living in Middletown. Yesterday was the State Cyclocross Championships and my 1st cross race ever. It was a really good time, despite being totally exhausted after the grueling race. The course was super fun even though the grass was really wet when the race went off at 9am. Head over to my personal photos page and check out the photos T and I shot throughout the day. Lolli was repping Ghostship hard and handing out $1 dolla' primes during the mens Elite race. It was sight watching pros sprint for dollar bills! So the General Chee, the official team vehicle of TYRANT has been laid to rest. After 10 years and 210,000 miles of hell raising my Toyota Corolla has finally reached its limit. I couldn't of asked for a more reliable car! I've been all over the USA with 1-3 bikes on the roof, ridden amazing parks, raced amazing races, and saw some great sights! Taking the place of the Chee is a 2008 Toyota Matrix. Lots more room than the Corolla, the same reliable Toyota engine, and its new! I'm awaiting R. Gates to call with the "official name" for my new ride...ha ha ha! 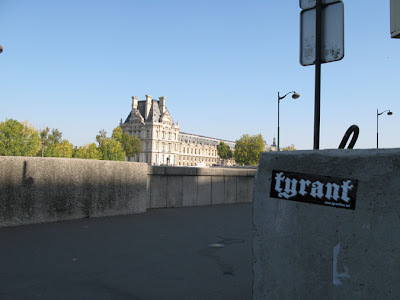 So T went to Paris and decided TYRANT needed to rear its ugly head overseas. Take a look HERE. TYRANT outside the Louvre in Paris. If you don't know what the Louvre is get educated!!! So TYRANT kicked in over $100 of merch. 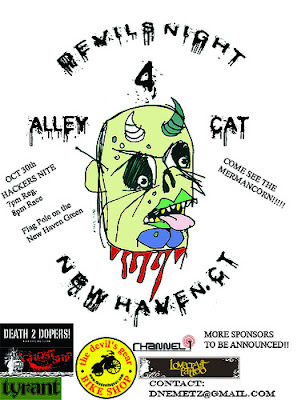 for this years Devils Night Alley Cat Race in New Haven. Get down the green by 7 on the 30th to register to race. It's going to be nuts! 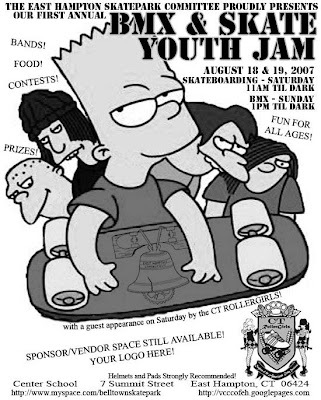 YOU HEARD IT HERE FIRST: TYRANT is also kicking in a hoodie, gear bag, sticker pack, and 6 pack of Pabst Blue Ribbon to the 1st person to complete the ENTIRE RACE on a BMX bike!!! That's the challenge, whose going to man up?!?!? Too dark to road ride! Don thought this table sucked. I thinks its dialed! Turn up your volume and watch the video. Digger Davis is off the hook! I mostly shot film in Vegas, but here is a quick montage of the video I did shoot. So we landed at Bradley Airport at 5:30 am and I came home and slept until now.....1:45ish. What a super fun, but tiresome trip!I'm not going to get crazy in depth, its INTERBIKE....every manufacturer has something cool and exciting and new technologies are popping up left and right. Some of the stuff I liked...FBM's Sword track bike, Fly Bikes 2008 model line, as well as the 2008 DK's and We The People's. 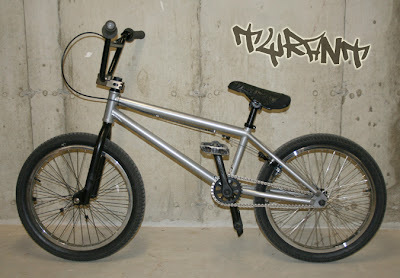 That paint jobs are killer for 2008, check them out! I didn't shoot a ton of BMX related film, click here to see. I did shoot a ton of touristy shots which can be seen via this link to my art blog, : through these eyes. I also shot a bunch of film of the Team NERAC riders at the Cross Vegas race and the USA Crit. Championships. 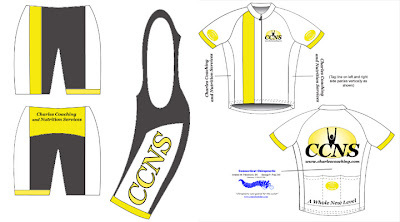 Those photos can be seen via the CCNS Pedal Power Cyling Team site. Enjoy! We are stuck in Denver, CO right now awaiting a connecting flight and I am paying 25 cents a minute to write this stupid message. INTERBIKE was so crazy, so many new things out there in the bike world. Stay tuned for lots of photos, news, and what not. 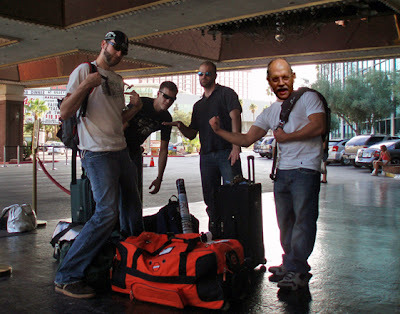 On a side note, Van Homan was on our plane out of Vegas...kinda random. OK, I'm off to wait for the plane. Good God I can't wait to get home!!! So next Sunday at 5 AM Fall officially arrives....therefore we got in one of our last Summer street sessions tonight. 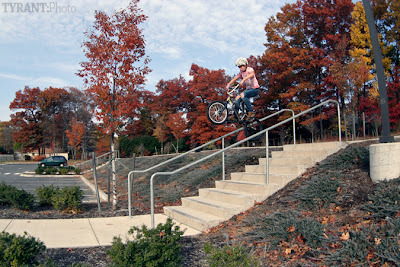 I picked up Tiny Tyrant and we met up with a crew of 9 other riders for a fun Middletown session. Check out the photos HERE. Also, Begin Ramp #2 is coming along nicely at their new home. 6 foot quarter, 4 foot spine and roller in the middle, and 5 foot quarter on the other side. Dialed!!! Yeah, so 11 days till we leave to Vegas for INTERBIKE. Just as we're starting to get really psyched to go this ad comes along and makes things even more exciting! 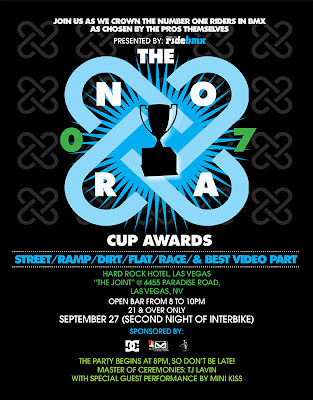 Leave it to Ride BMX and the NORA Cup Awards. The Hard Rock...Open bar...A midget KISS cover band! Digger Davis might be headed to jail that night! So Mr. Hebrank has been playing with bleach and t-shirts out in MinneCRAPolis. I told Shawn I'd do the same at the TYRANT's Lair and see what I could come up with. 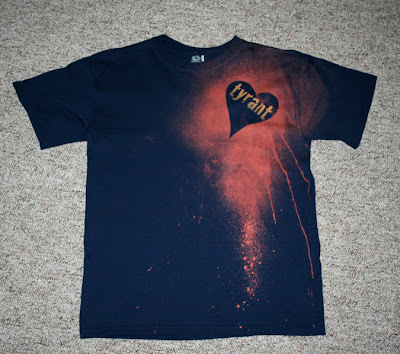 Below is the 1st of 6 rad "Bleeding Bleach" TYRANT shirts. I have a few more including chains and other bike parts...stay tuned! So for all of you that have been e-mailing me asking if you can ride in the Pedal Power Stunt Show this year...no you can't!...there isn't going to be one! Maybe next year? Hey, Hey all you riders out there! I'm trying to unload my FBM Deployer FRAME (Not the whole bike!). It is one of the Limited Edition Silverback colored ones that are COMPLETELY SOLD OUT!!! I bought this frame in early Spring from Vic at Circuit BMX in Pawtucket, RI. It is in MINT condition, I babied it!!! The reason I'm selling it is cause it is too small for me! I'm 6' 4" and need at least a 21". - 6 months old and in GREAT condition!!! 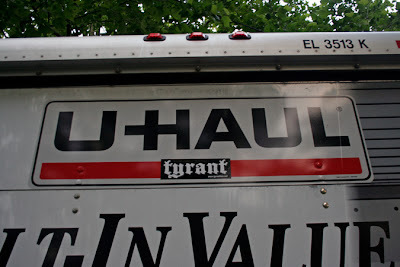 ...and I'll throw in a TYRANT t-shirt and a ton of stickers to the buyer! 1. I need to fit more BMX time into my busy road riding schedule. I couldn't manual 10 feet today! 2. The Middletown Police need to do their job and pursue criminals, not harass fisherman and bike riders at Harbor Park. 3. Jake Lineberry either has balls of steel or is out of his mind....or both! and I don't think he feels pain? So with that said, the session was short and sweet. Jake Lineberry hucked himself around like usual pulling all kinds of crazy stuff. Like #3 above says, I really don't think Jake feels pain. I watched him double peg a huge stair set and totally wreck at the bottom, scorpion grinding and going head over heels entangled in this bike. After shaking off the crash, checking out his arm (which was bleeding in 3 spots and his elbow had swelled to the size of an apple) he walked back up the stairs and did the rail again! Arnwine was bombing at high speed like usual pulling out jibs here and there. Expect more pictures this week! For now check out what I shot at TYRANT's Flickr. I've never done a product review on here before so here is the first...and maybe the last. I just bought this new home bike rack system and it kicks major a$$...so I recommend you go get one for yourself! 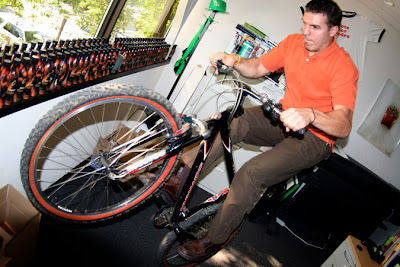 The Rubbemaid Fast Trak System has a killer vertical bike holder that is effective and inexpensive! I bought the 48" track and 4 bike holders for less than $50 (at Home Cheapo) and I mounted the system in my spare bedroom...which is now giant storage closet! 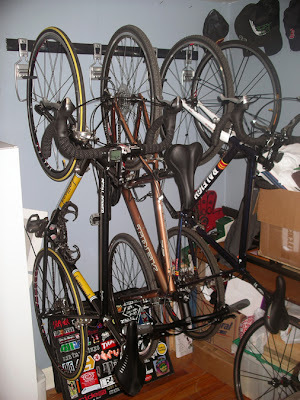 So if you live in an apartment of small space and need to get your bikes up off the floor, look into this rack!